In the Los Santos province on Panama’s Azuero Peninsula, nestled among large farms and cattle ranches, is the small town of Las Tablas. From here, Panama City is just a four-hour drive, and the Pacific Ocean is close by, which offers some of the best sport fishing in Central America. Las Tablas is famous in Panama for being the cradle of folklore and traditions and as the epicenter for street celebrations. During the Pollera festival which takes place in July, hundreds of women wear elaborate handmade dresses and dance in the street to festive Panamanian music. The country’s most famous Carnival festival takes place on the four days preceding Ash Wednesday. As you’d expect, all festivals involve plenty of music, dancing, street food, fireworks, and drinking. Las Tablas has local hospitals, dentists, and shopping. And 30 minutes away in the town of Chitre there is two larger hospitals and several larger supermarkets. This area typically appeals to people who prefer a simpler, traditional lifestyle, with amenities close by, and a lower cost of living. Few people speak English here and you can expect signs and menus to only be in Spanish….so if you considered living here it’s a good idea to brush up on the language. The main attraction of Las Tablas is its authentic culture, which is still very much intact. Generally, Las Tablas is not on the radar of most foreigners. In fact, only about 20 expats live in the town, with another 20 living nearby. This is a small proportion of the population given that Las Tablas has several thousand residents. There is, however, a more robust expat community in nearby Pedasí, which is only 25 miles away. Las Tablas is a friendly town–people are sociable and doors are always left open. Folks here tend to value friends and family, especially the elderly, and there is great respect for traditions, customs, and folklore. There is no organized expat community in Las Tablas as the expats prefer to fully integrate into the local community. Las Tablas has several good restaurants, including Dolce & Saladito, La Maestra, and Restaurant Mama Pina, which have friendly and helpful staff. But, if you want an American fast food meal, McDonald’s just opened a few months ago. For your groceries, Super Carnes is an American-style store with low prices. Super Rosa is good for fresh meat, and local vendors sell fruit and vegetables out of the front from their trucks. You don’t need a car in Las Tablas, but if you need help getting all of your shopping home, taxis are plentiful and inexpensive. The area is in a central location to visit several nearby Azuero peninsula attractions. The scenic road over the mountains to Tonosi and the remote beaches of Cambutal offer beautiful day trips. Just 30 minutes from Las Tablas and a 20-minute boat ride off Playa Arenal is Isla Iguana, in Pedasí. A National Wildlife Refuge, this small white-sand beach is lapped with turquoise waters good for snorkeling. The island is also home to thousands of hermit crabs and hundreds of green and black iguanas, as well as a vital nesting ground for frigate birds and sea turtles. Typically, homes in Las Tablas are about 1,100 square feet with one or two-bedrooms and a bathroom. Due to the low saturation of expats, property prices are relatively low here. Near the main area of town, lots can be purchased for $10 to $15 per square meter. A three-bedroom, two-bathroom home and a lot, with parking, can be bought for $50,000 to $70,000. Currently, there are four new North America-style developments being advertised as starter homes. With no appliances, air conditioning, or landscaping included, prices start at $60,000. 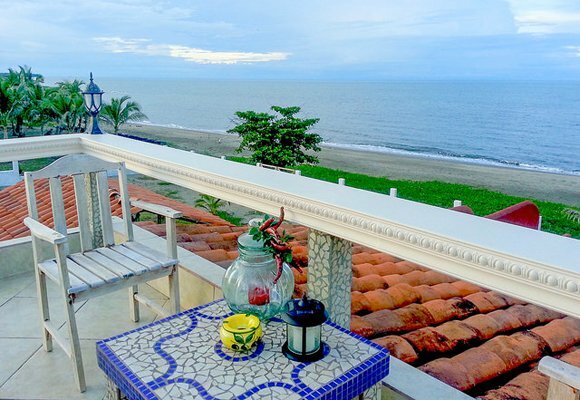 Just a 15-minute drive from Las Tablas, a beachfront house on beautiful Uverito can be bought in the $155,000 and up range . Be advised, if you are considering buying property, only purchase titled property and use a good real estate agent. If you prefer traditional living, with amenities close by, a low cost of living, and a warm local community, then Las Tablas is worth considering. It is graced with more sunny days and less humidity than any other part of the country. And the cost of living is the lowest in Panama: Here, a couple can easily live on $1,000 a month, including rent, as expats Joyclyn and Armand Brodeur have found out. Originally from St. Louis, the Brodeurs came to Las Tablas in August 2014 to test-drive their Panama retirement, so to speak. Armand, 66, and Joyclyn, 59, long yearned for a tropical, beach lifestyle. At the same time, they wanted to choose a place where it was possible to live on a social security check. “Las Tablas fits the bill,” they say, citing the excellent infrastructure and affordable healthcare. The Brodeurs chose Las Tablas so they could live well, without sacrificing the good things in life. They were amazed at the local supermarket prices…55 cents for a beer and $4 for a bottle of wine. Says Armand, “I treat myself to Clan MacGregor scotch at $9 a bottle, about the same as up north. Bacon is about $4 a pound, but it costs even more in St. Louis.” Even so, they spend just $65 a week on groceries. Utilities are also extremely inexpensive. Their first power bill was around $20 (no air conditioning). “Our water is included in our rent, and trash pickup is $18 a year,” they say. Vonage internet phone service is $32 a month and allows for toll-free calls to the U.S. and other countries. Add to that another $30 to $40 a month for two cell phones (calls plus data) and $52 for bundled cable and internet. With more money in their pockets and no shortage of time on their hands, the two have been able to fully immerse themselves into the local way of life. At a recent festival in rural Panama, Joyclyn and Armand had one of their first brushes with Panama’s colorful culture. “I saw a bull run, and it was fascinating,” says Joyclyn. There were oxcarts painted in bright primary colors, local boys in traditional garb, and girls in richly embroidered polleras—Panama’s much-admired national costume. “They would pose and display their dresses,” she says. “It was the best party I had ever seen. I even danced with an older local man. The music was playing and he was twirling me around,” she says, smiling at the memory. The people of Panama are another major plus for the Brodeurs. “The neighbors are very friendly and we are inundated regularly with gifts of wonderful Panamanian food,” says Armand. When they’re not dancing and socializing, you can often find Armand and Joyclyn enjoying their home in Las Tablas. Says Armand, “The day starts with Panamanian coffee—usually on the front porch. We have a papaya tree in the backyard and have fresh papaya regularly for breakfast.” It’s a simple, effortless lifestyle… though the nearby beaches do make it sound a bit glamorous. In the Pedasí region, about 45 minutes away by car, are some of Panama’s most pristine stretches of sand. And the fishing is legendary. But the ocean-loving Brodeurs don’t have to go far to get their fix. The craggy shores of Uverito beach are mere minutes from the Las Tablas town square. “Our anniversary was in December, and we spent it at Uverito,” say the Brodeurs. Christmas Day and New Year’s Day found them back again, enjoying the beach alongside many locals. “We lament to friends on Facebook about the grueling 11-minute drive to the beach,” Armand jokes. Trips to Uverito aside, the Brodeurs do most of their traveling by foot, as many of the locals do. And all the walking has had an unintended effect. “We have dropped an incredible amount of weight,” says Armand. “And we’re not even eating as healthy as we ought to.” Joyclyn says walking is also the best way to get the lay of the land. “I know where to go for a lot of things now…and with the hot weather, we don’t eat as much. I’ve dropped a whole size,” she adds. Las Tablas is a far cry from Panama City. You’ll find no skyscrapers here…in fact, structures more than two stories tall are rare. Condo living is more of an abstract concept here, as people tend to live in boxy, wide-terraced homes. In most cases, they are framed by greenery that runs right up to the road. Here and there is a casa de quincha, a country cottage made the old-fashioned, wattle-and-daub way, with clay and straw. The town plaza is graced by a small, white, colonial church. 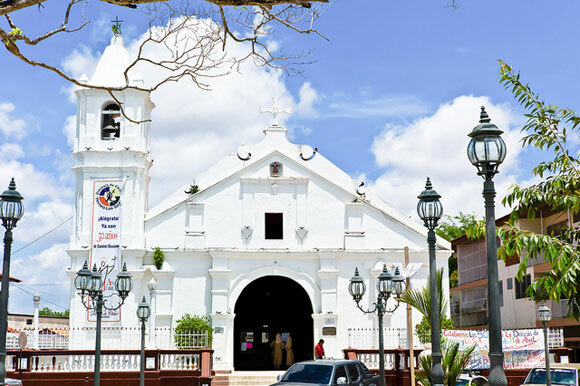 Like most of Las Tablas, it is unassuming, though visitors who enter are met with the soft glow of the ornate gold altar, a relic from Panama’s earliest colonial days. A short walk from the main plaza, the Brodeurs have rented a small home for $200 a month. They paid $600 for a slightly upscale apartment during their first month in Las Tablas. It was ready to move into and in a central location, so it worked while they were getting settled. Soon, however, they were ready to try a local-style home. They just did a bit of networking—and used the few words of Spanish they’ve learned since their arrival. It paid off. An expat introduced them to a local homeowner and the next thing they knew, they were signing a new rental agreement. These days, the Brodeurs say they have many more friends— both Panamanian and expat—than they did “back up north.” Life is more social and more fun. As Las Tablas is at the nation’s center, they can travel anywhere with ease. They recently visited Panama City—it’s about four hours by car due east. The western province of Chiriquí is similarly close, so they’re planning a trip to the highland towns of Boquete and Volcán Barú in the near future. Will the Brodeurs stay in Las Tablas? Who knows—they are still exploring the country, and they’re keeping an open mind. A few months into their “test drive,” however, they’re already quite certain that Panama is right for them. “I wanted access to the ocean, friendly people, and palms…and I got it all,” says Joyclyn. “It would not break our hearts to live in Las Tablas for the balance of our days,” says Armand. To live in Las Tablas, you will need a little Spanish. “It turns out there are more English-speaking people here than we thought,” say the Brodeurs. But they studied for two weeks at Panama City’s Spanish Panama and highly recommend it. An attorney himself, Armand says to waste no time getting to a lawyer. He and Joyclyn contacted immigration attorney Rainelda Mata-Kelly before traveling to Panama. She gave them all the requirements for the famed pensionado program. “Thanks to her good offices, we already have our visa,” he adds. Anyone with a pension of at least $1,000 a month ($1,250 for a couple) may apply for the residence program. And members get access to Panama’s government-mandated retiree discounts. These are wide-ranging. The Brodeurs are entitled to 25% off their power bill, 50% off entertainment, and 10% to 25% off medical expenses, restaurant bills, transportation, and more.